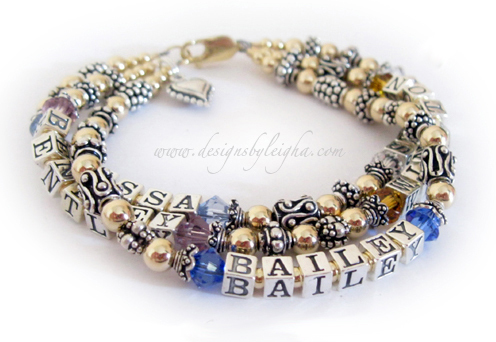 This all gold, sterling silver and Bali style Multiple Name Bracelet shown on 1-string bracelet with 2 names and birthstone crystals by Swarovski (3-string with 4 names shown below without birthstones). If you have 3 short names you could put them all on one string. 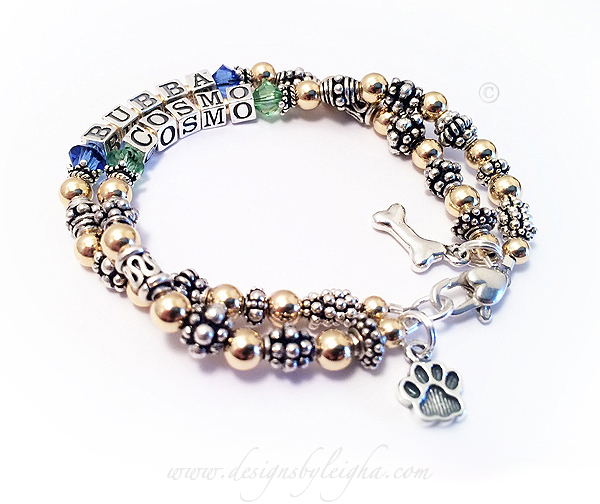 You choose the clasp and charms during the ordering process. A 14k gold plated lobster clasp clasp is shown. You may add as many names as will fit on each string. The alphabet block letters are 4.5mm with letters on all 4 sides. Questions? 615-490-2177 I make and ship everything the next business day. 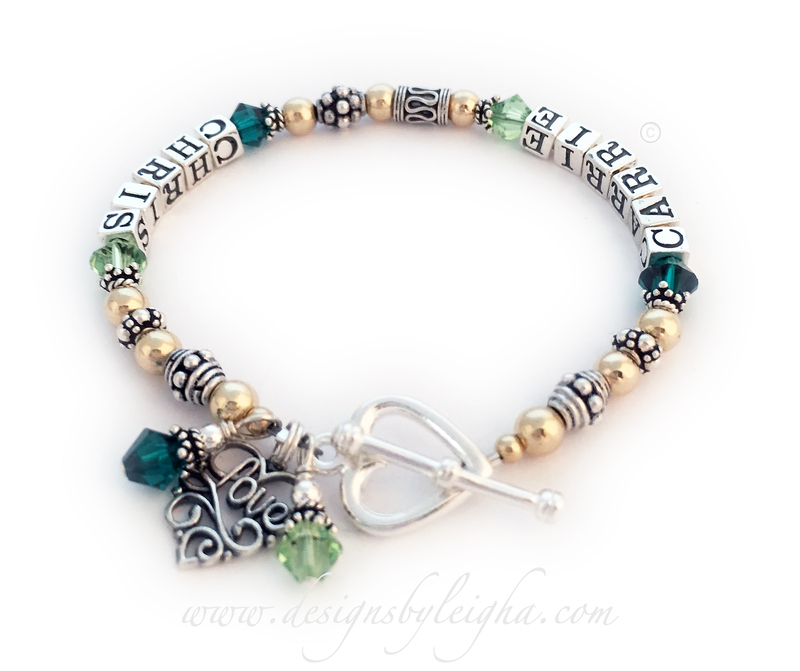 They upgraded to a Heart Toggle clasp and added 3 charms: 2 Birthstone Crystal Dangles and a Filigree Love charm. 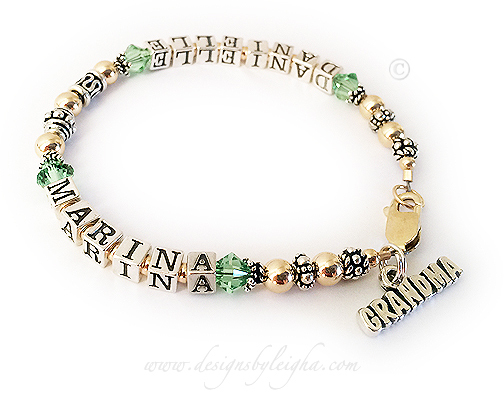 To order a bracelet like this one enter: LOREZENO/Jan - STEPHEN/Jan and pick 1 string. To order one like this one... enter: Lorenzo/Jan - Stephen/Jan / Juliana/Sep - Franco/Jul and pick 2 string. Charlotte (Diamond), Jeffrey (Aquamarine), Mia (Pearl), Zoe (Sapphire), Thomas (Aquamarine) Jillian (Sapphire), Henry (Ruby) To order one like this enter: 1) Charlotte/Apr, Jeffrey/Mar 2) Mia/Jun, Zoe/Sep 3)Thomas/Mar 4)Jillian/Sep, Henry/July choose a 4 string bracelet.